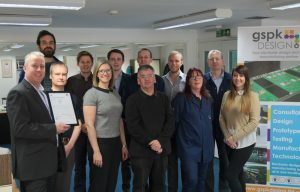 GSPK Design start 2017 as they mean to go on as they are delighted to announce the recent accreditation and approval of their quality management systems to ISO 13485:2016, a requirement for the design and manufacture of electronic devices for medical use. The news of this success comes on the back of SBRI funding received in 2016 as GSPK Design come to the final design phase and manufacture of a revolutionary new EMG (electromyography) switch which will be classified as a Class I medical device. This wearable medical device, Emego, aims to help those with severe disabilities control equipment that they use on a day to day basis. Working with collaborative partners, Barnsley Hospital, Sheffield Teaching Hospital and the NIHR Devices for Dignity Healthcare Technology Co-operative (D4D), the project marks a point of growth for the electronics design and manufacturing company. Following on from process and documentation improvements throughout 2016 and an extensive independent quality systems audit, North Yorkshire based electronic designers, GSPK Design were awarded a full accreditation by the British Standards Institution (BSI). ISO 13485:2016 is a highly-commended approval that sets the standard for companies to design and manufacture finished medical devices. Now in its 17th year of operation, GSPK Design are set to grow from strength to strength with this successful news. Having worked on many different electronic projects throughout the years, GSPK Design has established itself as one of the leading electronic product design companies in North Yorkshire.